Apple has introduced the iPhone 7 and iPhone 7 Plus with Tim Cook’s presentation at Keynote September 2016, along with a set of online films “Don’t Blink”, “Design”, “Introducing iPhone 7”, and “Introducing Airpods”. The new iPhone, available from September 16, features new advanced camera systems, stronger battery life, immersive stereo speakers, water and dust resistance, and, controversially, comes without the traditional 3.5 mm audio jack. Apple’s wireless Airpods are presented as the sign of a world to come without audio cables. The “Don’t Blink” film provides a summary of the Apple iPhone 7 Keynote presentation in 107 seconds, with the microphone drop symbolising the end of the 3.5 mm jack. The Apple iPhone 7 12-megapixel camera includes optical image stabilization on both iPhone 7 and iPhone 7 Plus, and a larger ƒ/1.8 aperture and 6-element lens, 12-megapixel wide angle camera as iPhone 7 and adds a 12-megapixel telephoto camera that together offer optical zoom at two times and up to 10 times digital zoom for photos. The dual 12-megapixel cameras on iPhone 7 Plus work together to offer 2x optical zoom and up to 10x digital zoom for photos. The dual 12-megapixel cameras on the iPhone 7 Plus enable a new depth-of-field effect. Machine Learning technology separates the background from the foreground to achieve amazing portraits once possible only with DSLR cameras. Additional camera advancements include New Apple-designed Image Signal Processor, which processes over 100 billion operations on a single photo in as little as 25 milliseconds, new 7-megapixel FaceTime HD camera with wide color capture, advanced pixel technology and auto image stabilisation, and new Quad-LED True Tone flash that is 50 percent brighter than iPhone 6s including an innovative sensor that detects the flickering in lights and compensates for it in videos and photos. The new custom-designed Apple A10 Fusion chip’s CPU now has four cores, seamlessly integrating two high-performance cores that run up to two times faster than iPhone 6, and two high-efficiency cores that are capable of running at just one-fifth the power of the high-performance cores. Graphics performance is also more powerful, running up to three times faster than iPhone 6 at as little as half the power, enabling a new level of gaming and professional apps. The new iPhone comes with EarPods with Lightning connector, as well as a 3.5 mm headphone jack adapter that allows customers to use old headphones and accessories. 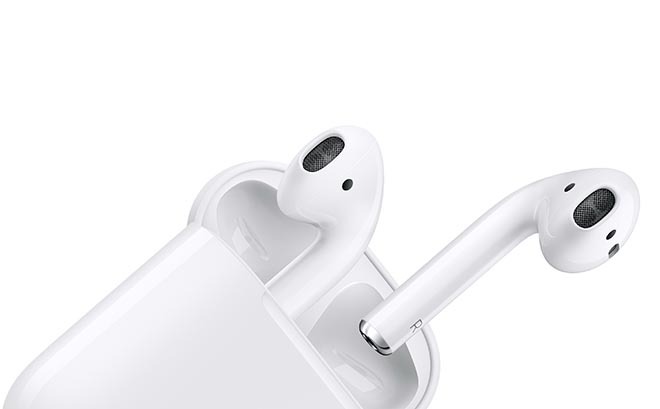 AirPods introduce an effortless wireless listening experience packed with high quality audio and long battery life, coming in late October. Featuring the new Apple W1 chip, AirPods harness the power of Siri, allowing you to access your favorite personal assistant with just a double tap. New stereo speakers offer amazing and immersive sound that is two times louder than iPhone 6s, offering increased dynamic range of sound and a higher quality speakerphone. iOS 10 introduces a huge update to Messages that delivers more expressive and animated ways to message friends and family, the ability for Siri to do more by working with apps, new ways to interact with apps and even more places to use 3D Touch, beautifully redesigned Maps, Photos, Apple Music and News apps, and the Home app, delivering a simple and secure way to manage home automation products in one place. iOS 10 also opens up incredible opportunities for developers with Siri, Maps, Phone and Messages APIs, allowing customers to do more than ever with the apps they love to use.